Construction of the stool is complete. I just need to apply finish and upholster the seat frame. However, to avoid overwhelming you with photos, I'll split the remainder of the project over a couple of posts. 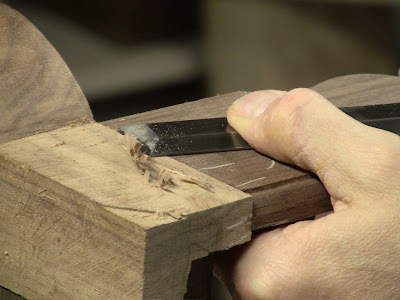 There are a number of photos of carving steps, to show how creative you have to be attacking the various bits that need to be carved out, while avoiding splits, cracks, and stray tool marks. 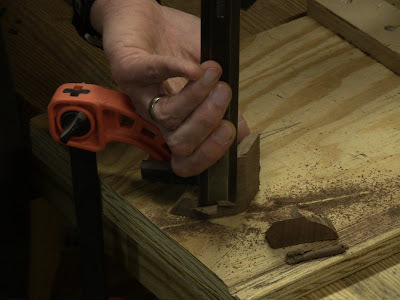 There are a number of points where I was carving on unsupported short grain, so I had to take tiny amounts at a time. 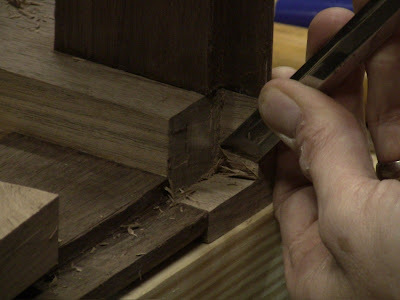 The next part to work on was moulding the top edge of the rails. The inside is a rabbet to take the slip seat, and the outside has a quarter round and lip. Marking out the rabbet width. 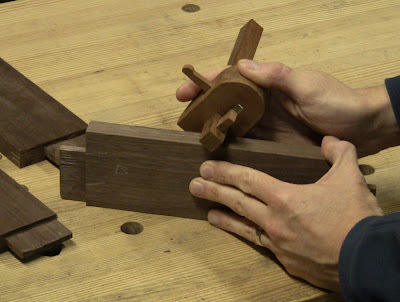 Forming the rabbet with my wooden skew rabbet plane. It produces lovely ribbons. The first couple of passes need to be done carefully to stay on the scribe line. The rest is fast once the initial shoulder is established. After taking it down to the proper depth, I laid the piece on its face to square up the side of the rabbet. 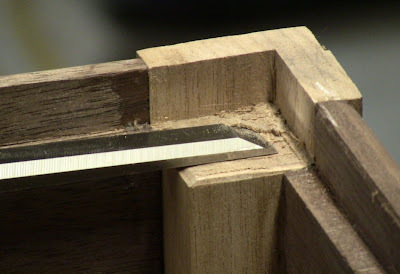 I laid my paring chisel down flat in the rabbet to pare in the other direction where the grain didn't allow using the plane. 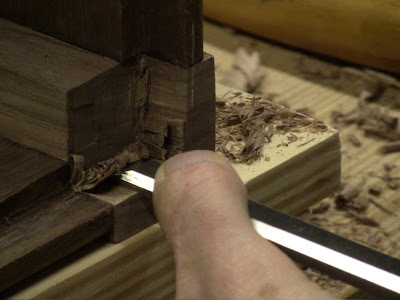 Forming the lip on the outside face. The bottom edge of the rails have some simple scroll work. Period pieces are shaped to smooth curves on the visible face, then the curves are beveled back and left rough on the inner faces. 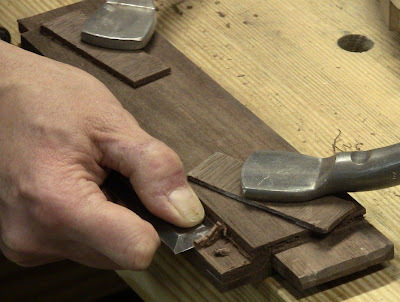 This can be done with paring gouges or rasps. Rasping the curves down to the line and beveling back. 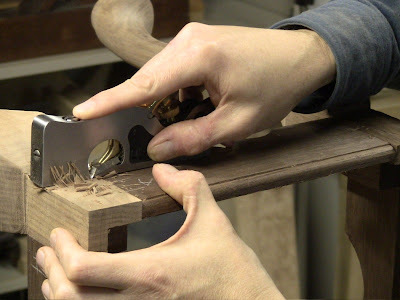 Using the circular spokeshave for fast stock removal. At this point the rails were complete. 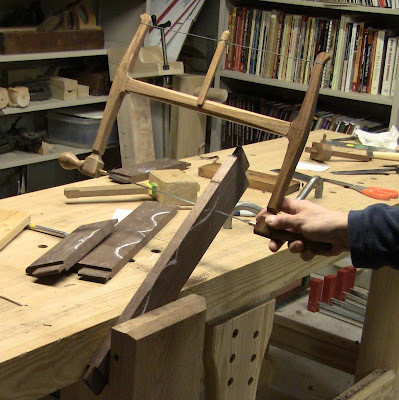 The last step before glue-up was roughing out the recess for the slip seat in the top of the legs. 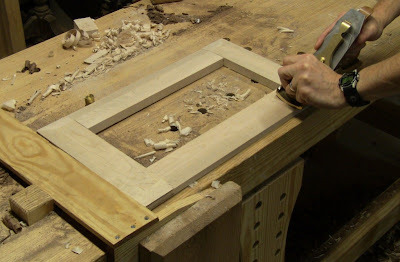 I just wanted to remove the bulk of the waste; I would take it down to exact dimension after glue-up. Chiseling out the waste. 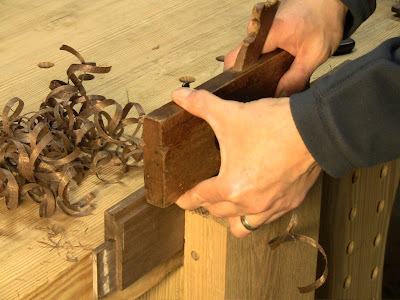 This is like chopping a mortise. The first task the next day was to flush up the post blocks with the rails. This is one of the places where I had to pay close attention to the grain. Being too aggressive will cause tearout in what needs to be a pristine face. 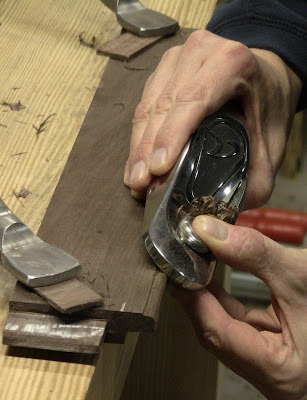 Shaving the block down flush with a small shoulder plane. 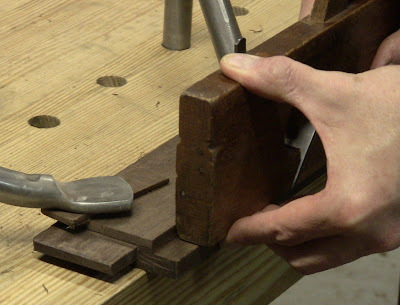 Another method, swinging the chisel in a shearing cut while it rests flat against the rail. 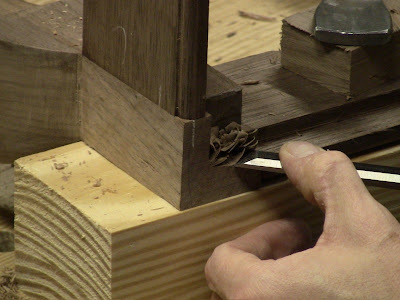 Once the outer faces of the post blocks were flush, it was time to finish shaping the inner walls of the recesses. This flushes them up with the inside edge of the rabbets. Here, I had to be even more careful, because I was dealing entirely with end grain, in a place where any mistake would be very obvious. Any aggressive cuts would likely dig in and run with the grain. At some points I seemed to be working just two grain fibers at a time. This stuff will drive you bonkers! Coming in straight down the end grain with very light cuts. 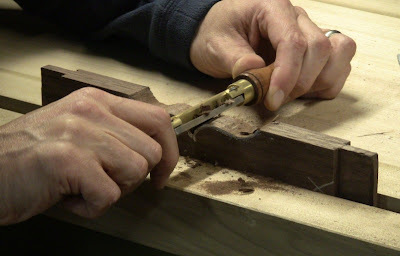 Using a skew chisel to come to a crisp inside corner. Coming in from the side. 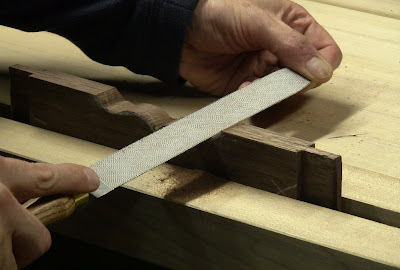 Finishing off with the wide paring chisel registered flat against the inside of the rail. Next was the knee blocks. 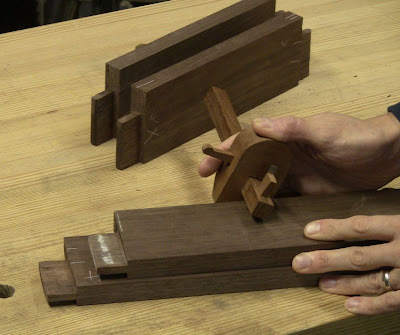 These are small compound curved pieces that are both decorative and act as supporting glue blocks for the legs. 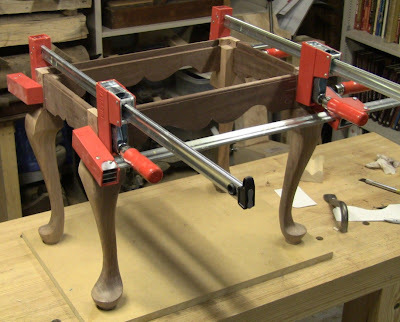 There are eight of them, one for each leg-rail joint. They're quite awkward to work with. 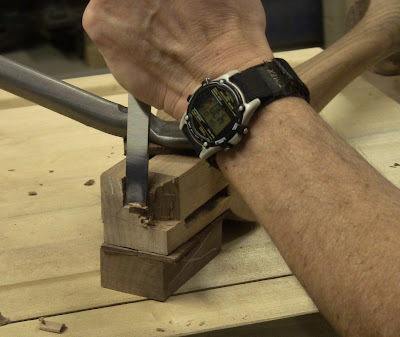 Roughly sawing out a knee block. After sawing the adjacent face of the block off at an angle, roughly paring its convex curve. Gluing the block in place. 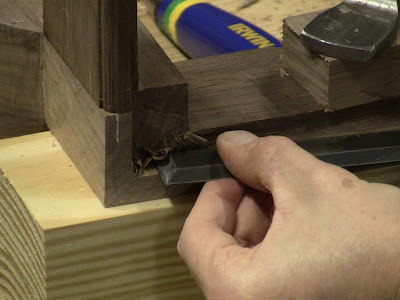 This takes some fiddling with the clamp to make good contact on the side and top of the block. This is one place where the fast setup time of hide glue would be a real advantage. 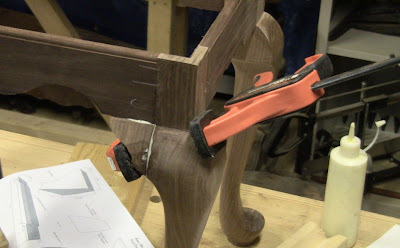 With one block on each leg and clamps sticking out at odd angles, I built the seat frame while the glue dried. 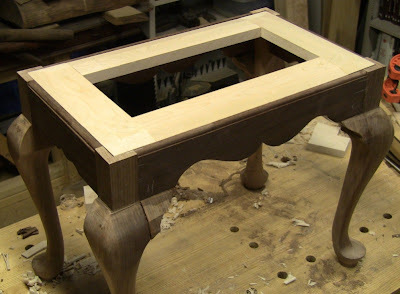 This is pretty basic work, except that it uses bridle joints, and the top outer edge of the frame is chamfered so that it will be flush with the top edge of the rails when set in place. 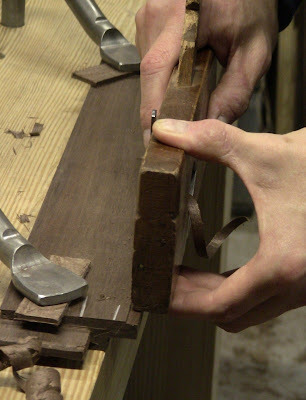 After sawing down the ends, chopping out the waste of the bridle joint, basically an open-ended mortise. 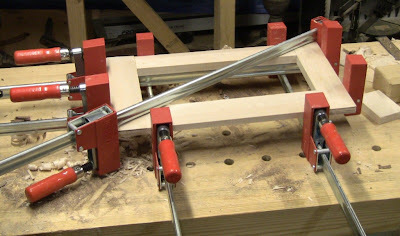 The frame glued up, with a clamp on the diagonal to pull it into square. Once the glue on the knee blocks and seat frame was dry, I trimmed up the post blocks and frame so that it fit properly in the rabbet. It needs to sit flat without rocking, with 1/16" space all around for the upholstery material that will be wrapped around it. 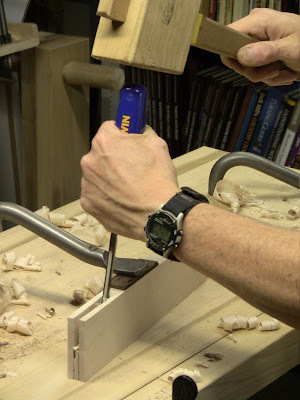 Paring out a high corner in one of the post blocks, using the corner of the chisel the same way I used it to trim the tenon shoulders. Evening out the chamfer at a joint. 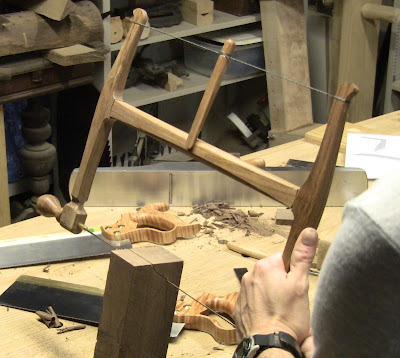 I also had to plane two diagonal corners on the bottom side to deal with a little twist in the frame and make it sit flat, since my bridle joints were a bit sloppy. The seat frame resting in its rabbet. You can see the first set of rough knee blocks on the corners. Next will be adding the second knee block to each leg. 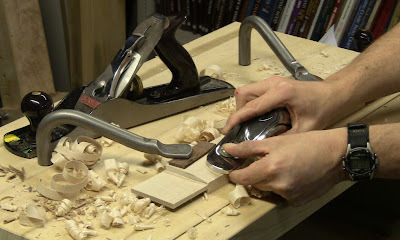 Then they all need to be carved down flush with the curves in the legs.